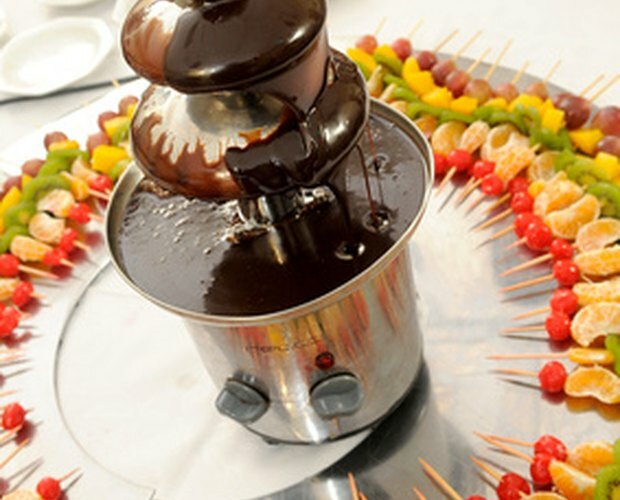 A chocolate fountain allows you to serve your guests fondue-style melted chocolate for dipping fruits, cookies or candies while creating an interesting centerpiece on your dessert table. 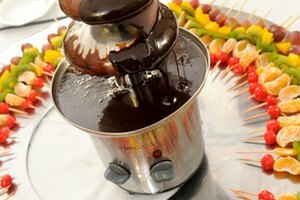 The Rival Chocolate Fountain also has a setting for serving cool foods, such as dressings or dips for vegetables and bread. Whichever type of fountain you choose to display, setting up and operating a Rival Chocolate Fountain is a simple task. Place the bowl-shaped piece of the chocolate fountain onto the base. Twist the bowl clockwise until it locks into place. Insert the auger into the hole in the center of the bowl. The auger resembles a large screw. Place the tower on top of the auger. The tower is cone shaped and fits into the hole at the base of the bowl. Turn the tower clockwise until you hear two snapping noises and the tower is locked in place. Place the guard over the tower and push the guard down until it rests on the bowl. The guard is the smallest of three round fountain parts with a hole in the center. Place the large canopy on top of the guard. The large canopy is the largest of the three round fountain parts and should resemble an upside-down bowl when placed on the fountain correctly. Place the small canopy on top of the large canopy. This part is a smaller version of the large canopy and also resembles an upside-down bowl on the fountain. Place the cap onto the top of the fountain's tower, lining up the groove on the tower with the tab on the cap. Snap the two halves of the drip tray together and slide the drip tray, with the notches facing up, over the tower and canopies. 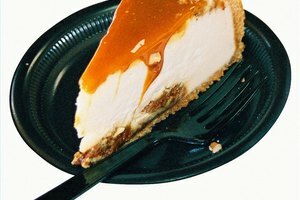 The tray will rest on the edge of the fountain's bowl. Heat 2 inches of water in the lower pan of a double boiler over medium heat. Add chocolate to the upper pan of the double boiler. Add approximately 1 oz. of vegetable oil per every 3 oz. of chocolate you are melting to the chocolate in the upper pan. The oil will help the chocolate flow smoothly through the chocolate fountain and prevent clogging. Stir the chocolate frequently until it has melted. Plug the chocolate fountain into the electric outlet. Turn the fountain to the "Heater" setting using the control knob located on the base of the chocolate fountain. Allow the fountain to preheat for three to five minutes. Pour the melted chocolate slowly into the bowl of the chocolate fountain. Turn the control knob to the "Heater/Motor" setting. 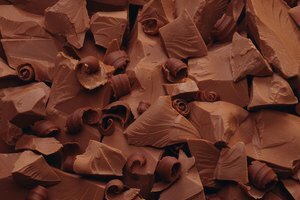 The chocolate will begin to flow through the tower of the fountain. Operate the chocolate fountain on a level surface. Serve cool dips or dressings in the fountain by skipping the preheating period and setting the fountain to the "Motor" setting after filling the bowl. Do not set the chocolate fountain to the "Heater/Motor" setting until the chocolate has been adding. Running the fountain dry at this setting could damage the motor.